Sheriff Hood became the Madison County Sheriff in January 2018 and as Sheriff, he commands a work force of 160+ members consisting of Corrections Officers, Road Patrol Deputies, Civil Division, Pistol Permit Division, Children’s Advocacy Center and oversees a 9.5 million dollar budget. Sheriff Hood began his career with the Madison County Sheriff’s Office as a Corrections Officer and graduated from the Mohawk Valley Police Academy in 1991. From there he worked as patrolman at NYS Parks Police, Village of Clinton, and Town of Kirkland until 1993 when he became a patrolman with the Syracuse Police Department. While at Syracuse PD, Sheriff Hood was a Detective with the Gang Task Force, S.W.A.T. Supervisor/Team Leader, FirearmsInstructor and was deputized to the US Marshal NY/NJ Regional Fugitive Task Force. He retired after 22 years with the Syracuse Police Department and then went to work with the Onondaga County District Attorney’s Office as an Investigator for Criminal Investigations/Homicides. Sheriff Todd Hood was born in Oneida, NY and has been a Madison County resident his entire life. Sheriff Hood attended Oneida City Schools graduating in 1987. 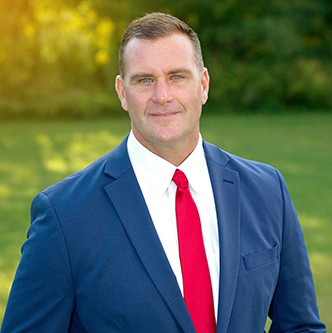 He went on to attend Springfield College in Springfield, Massachusetts and graduated with a Bachelor of Science Degree in Sociology and played Division II football. Sheriff Hood is married to his lovely wife, Kelly, and they have three children Matthew, Joshua and Anna.